You better swoop these up brah! 1. This t-shirt so people know all the stops you'll be making on your route home. Get it at Bored Walk on Etsy for $25. 2. This candle to send to your friends who have left the constant sunshine. Get it at Home Sick Candles from BuzzFeed for $30. 3. This pin to wear as your badge of honor. Get it from Pinorities on Etsy for $11. 4. This poster with all the members of the board. Get it Analog Supply Co. on Etsy for $30. 5. This freeway sign because it's not like you get enough of it when you're stuck in traffic. Get it from West Coast Patriot on Etsy for $90. 6. This keychain because the most magical place on earth is basically in your backyard. Get it from Towne9 on Etsy for $6. 7. This pillow so you can have your head in the clouds... oh wait you're from Southern California: there are no clouds. Get it from Target for $38. 8. This clock that'll get you on Orange County time. Get it at iluxo on Etsy for $40. 9. This onesie for when you welcome your baby to the wild wild west. Get it at EarthCadets on Etsy for $25. 10. This card to send to friends and family as a reminder that you're living in the state of constant sunshine. Get it at Violet Press and Paper on Etsy for $5. 11. This necklace to show people where your heart is. Get it at mxmjewelry on Etsy for $40. 12. A pair of Rainbow Sandals because they're part of the uniform. Get them on Amazon for $55. 13. This mug to sip on when you're enjoying the beach views. Get it at CalCoastTShirtsnMugs on Etsy for $11. 14. This pin that'll show people being from Southern California makes you cool as Ice. Get it from Nate Duval on Etsy for $9. 15. This t-shirt that'll give you the weather report 365 days a year. Get it at Target for $15. 16. This tote with all the LA landmarks. Get it from Tammy Smith Design on Etsy for $13. 17. This sign with the list of all the beaches you'll visit, in December. Get it at Orange and Park on Etsy for $30. 18. 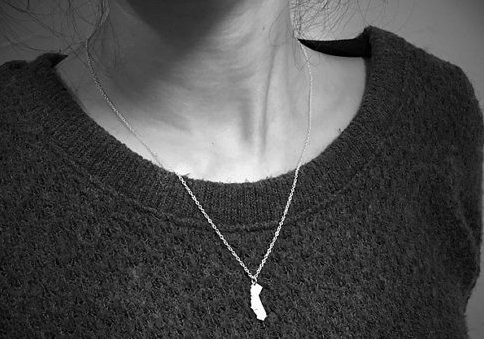 This necklace that'll let people know exactly where you come from. Get it from Mi Vida Shop on Etsy for $18. 19. This cutting board so that you can present your food in its best state. Get it at A Heirloom on Etsy for $48. 20. This doormat for when Snoop comes over to visit you in the LBC. Get it at J Party Designs on Etsy for $40. 21. This cookbook to give you a taste of home. Get it at Amazon for $27. 22. This t-shirt because it's true, you'll rep LA all day. 23. This bath and body oil to remind you of the scents of home. Get it at Anthropologie for $38. 24. This toy because babies need to learn their geography. Get it from Bannor Toys on Etsy for $18. 25. This holiday card that you'll send to your friends living on the east coast, or anywhere with temperatures below 70 degrees. Get it at Paper Parasol Press on Etsy for $5. 26. 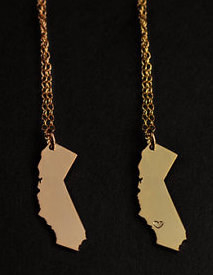 This necklace with your route on the PCH tracked for you. Get it from MG Artisan Pendants on Etsy for $14. 27. This map that shows how LA is made up of about a million different cities. Get it at Archie's Press on Etsy for $22. 28. This pin that brings us to the end. Get it at The Silver Spider on Etsy for $10.